We’ve talked about the new media revolution, and how scientists are publishing more research and information online, while traditional printed publications are experiencing a downward trend. If you’ve been watching, there has been a concomitant movement to make research open access, meaning making published data free, as evidenced by the growth of journals such as the Public Library of Science. This movement is aimed at improving the progress of science by making more information available for faster discoveries. In addition, a group of researchers has taken a brilliant step towards controlling their destinies and begun to ‘crowdfund’ their research via an initiative called SciFund, soliciting funds from individuals to support their work. As researchers begin to ‘take charge’ of their future in these endeavors which are linked and perhaps similar to the Occupy Wall Street movement, life science tools providers can partner with them, benefiting all. Let’s list a few ways that the status quo limits life science companies. 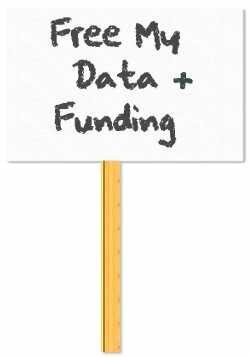 Funding for life science research, which directly affects the growth of tools providers, is determined by the federal government, and distributed via the peer reviewed grant process. Researchers carry out this research aided by products from life science companies and publish results in peer-reviewed journals which delay and heavily restrict the utilization of the information. So, the government, academic infrastructure, and the peer reviewed journals severely limit revenue, product development, and communication with scientists and their use of products. We’ve learned to put up with these limitations, but what if we embraced the #scifund and #openaccess (as they are known on Twitter) movements? Some of the benefits are listed below, and we are just beginning to scratch the surface. Find and engage thought leaders more easily. Who are the influencers in your field, what are they thinking about, and how can you work with them? In the past, finding them via traditional publications has been easy enough, although most of the work is 6-12 months old by the time it is accessible, and this multiplies the time they could publish any work they do with you or your products. With more researchers blogging and Tweeting about their data, or publishing it more quickly via PLOS, you can find the influencers and interact with them more quickly than before. As an added bonus, you’ll be able to use the data and figures on your own website, as PLOS information is free for commercial use. More opportunities to reach a targeted market. With more researchers publishing online and in niche blogs, you’ll be able to reach very specific audiences with your message, and obtain feedback. Partnering with a blog or a blog network is an easy way to go, or you can start your own website/blog and engage there, something we’ve done with the EpiExperts Epigenetics Community. Better product development. Daniel Mietchen, a science communicator who was part of the inspiration for this post, has an elegant SciFund proposal about a repository of research data in which scientists can learn from others’ work much more quickly. As a life science marketer, if you’re not drooling already, you should be. Access to targeted, real time information about what life scientists are working on is like the CRISP database on steroids! Additionally, the targeted advertising opportunities are mouth watering as well. Of course, we wouldn’t want them to feel as though their research is tainted by commercial interest, but think of the possibilities to react quickly to a researcher who has used your tools, and to feed this information back into product development. More control over funding. Related to this last point, think about the potential to have an effect on which life science projects are funded. Of course, if life science companies directly support all research, the funds will soon dry up, but it is interesting to note that data from Europe show that businesses already fund more research than the public. By getting involved now with projects such as SciFund, life science companies will get great PR and also make connections with digital influencer. As this Wall Street Journal article and related book point out, scientists who are sharing will have advantages and likely be more influential than those who do not. Life science companies could use their marketing channels to promote these thought leaders not only within the industry, but to the general public. Should we envision a future whereby academic research is fueled more directly by the public and those who influence them? Perhaps not that completely, as basic research is important, but the face of research will undoubtedly change. Efforts to affect government funding should also be on the table, with tools companies supporting entities like BIO. What can you do now? Comprendia serves as a liaison between life science companies and the thought leaders of these revolutions. We’d be happy to work with you to find ways you can find opportunities for synergies, contact us. One of the ways we facilitate communication is through our life science chat on Twitter, through the #ls_chat hashtag, @ls_chat Twitter account, and wiki. We’re having a special #ls_chat Wednesday November 16th at 10 a.m. PT to discuss SciFund, and we’ll have their founder Jai Ranganathan (@jranganathan) to answer questions as well, see the ones we’ve come up with so far and feel free to add. Follow along using the Tweetchat room and use the #ls_chat hashtag in your Tweets to ask or answer questions. See summaries of our previous chats as well.